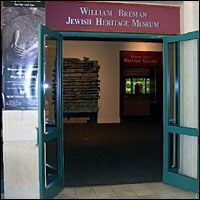 Through its exhibitions and programs, The Breman Jewish Museum explores the universal themes of respect for difference, responsible citizenship, human dignity and community-building through the lens of the Jewish experience. Parking: Limited free parking is available in the front of the building. Limited handicapped parking is also available. The museum is located in The Selig Center on the northwest corner of 18th Street and Spring Street in Midtown Atlanta, across 18th Street from the Center for Puppetry Arts. MARTA: Take the Red/Gold line to Arts Center Station. Exit the station at W. Peachtree Street and go right. Go across the street and walk two blocks north on W. Peachtree Street. Turn left on 18th Street. Cross Spring Street. The Breman is on the right on the corner of Spring and 18th Street in The Selig Center.